"The year is 2393, and the world is almost unrecognizable. Clear warnings of climate catastrophe went ignored for decades, leading to soaring temperatures, rising sea levels, widespread drought and--finally--the disaster now known as the Great Collapse of 2093, when the disintegration of the West Antarctica Ice Sheet led to mass migration and a complete reshuffling of the global order. Writing from the Second People's Republic of China on the 300th anniversary of the Great Collapse, a senior scholar presents a gripping and deeply disturbing account of how the children of the Enlightenment--the political and economic elites of the so-called advanced industrial societies--failed to act, and so brought about the collapse of Western civilization. 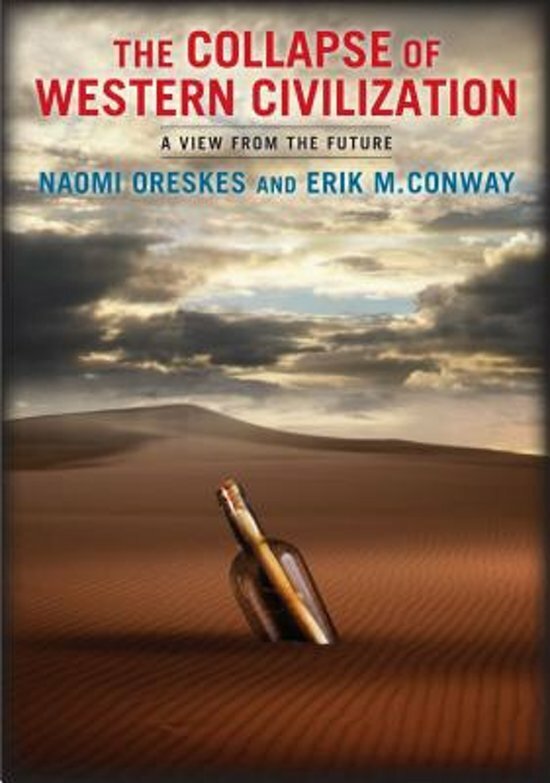 In this haunting, provocative work of science-based fiction, Naomi Oreskes and Eric M. Conway imagine a world devastated by climate change. Dramatizing the science in ways traditional nonfiction cannot, the book reasserts the importance of scientists and the work they do and reveals the self-serving interests of the so called ""carbon combustion complex"" that have turned the practice of science into political fodder. Based on sound scholarship and yet unafraid to speak boldly, this book provides a welcome moment of clarity amid the cacophony of climate change literature. Een boek dat niet te lezen is. Ik heb dit boek als E-boek gekocht maar door de lelijke DRM kan ik dit enkel op de computer lezen met een krakkemikkig programma van Adobe. Meestal lees ik alles op mijn Ipad in epub formaat. Verder wil Bol.com hun eigen lezer forceren. Niet met mij dus. Vaarwel Bol.com en adieu.